Hurricane Sandy may have been a blessing in disguise for Santiago de Cuba. Four years after its devastation, and at its 500th founding anniversary, the city is experiencing a rebirth. Last Christmas, my family and I found a Santiago rebuilt and revitalized, and the harrowing stories of destruction in the aftermath of the storm had been replaced by optimism and bustling activity. Tour boat of Santiago Bay. Photo by Rebecca Bodenheimer. 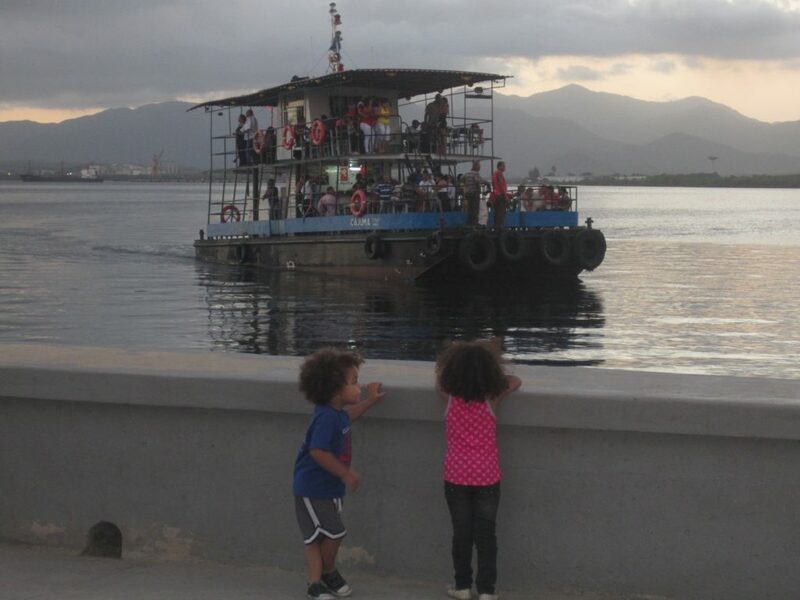 Since our last visit a malecón or seaside promenade has been built near the city’s port, with restaurants, a large children’s playground, and a workout space with various “machines” (think: low-tech). There is now also a boat offering tours of the bay for just 40MN or about $1.75, including a drink and snack. An important thoroughfare, Enramadas Street, is now a car-free boulevard with lively shops and restaurants where global capitalism is on conspicuous display: new Puma, Adidas, and children’s toy stores dot the boulevard. The expansion of private enterprise is also evidenced by the storefronts advertising homemade sweets, cell phone and technological services, and clothing. The latter are often bought in Miami at bargain prices, and brought in by Cubans who live in the U.S. (The poor quality and exorbitant prices of shoes and clothing in state-owned stores has created a huge demand for these private stores.) My favorite discovery during this trip was a dulce (dessert) that is currently all the rage in Santiago: homemade churros filled with condensed milk. ¡Qué rico! New nightclubs, music venues, and bars have sprung up throughout the city center, from Plaza de Marte all the way down to Parque Céspedes. Many of them cater not only to foreigners, but have admission prices accessible to Cubans as well. For example, El Salón del Son, off Plaza de Marte, charges 25MN (roughly $1.10) for a night of live music followed by a DJ. This is important because until now new venues and restaurants catered to foreign tourists in order to collect much-needed revenue. What we witnessed recently in Santiago, however, was the expansion of an entertainment and leisure infrastructure designed for domestic consumption, and in many cases, in pesos and at affordable prices. 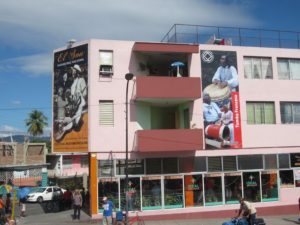 There is also a variety of free entertainment venues in Santiago, such as the large sound system that was set up in Plaza de Marte almost every night during our trip, playing a variety of timba and popular dance music genres. Interestingly, a sound engineer working in the Plaza told us that he was instructed not to play any reggaeton. Despite its ubiquity and popularity in Cuba, authorities often decry it as vulgar and lacking musicianship, and condemn its celebration of materialist consumption. It’s clear that, while reggaeton has gained a certain amount of official tolerance in the past few years, it is still a site of cultural battle in Cuba. Another new phenomenon is the availability of public Wi-Fi hotspots, which dovetail with the ever-increasing presence of smart phones and tablets in Cuba. Santiago’s two busiest plazas, Plaza de Marte and Parque Céspedes, are now Wi-Fi hotspots, a situation that – for better or for worse – has the potential to transform them from public spaces of sociability to sites of virtual connection. Getting online, however, is not free – one must purchase a card from the state-owned telephone company, Etecsa, which costs 2CUC (about $2) for one hour of an often-sluggish connection. That said, while expensive, that Internet service is now available throughout the island is a major shift, and a sign that the government no longer feels the need (or perhaps, is no longer able) to maintain such a tight grip on information. Finally, we noticed the much-improved availability of transportation options. While buses continue to be the most affordable, there are also communal trucks called pisa y corre (step-and-run) running along popular routes, as well as motorcyclists that charge 10MN or $0.45 for a ride. Taxis, both official and unofficial (i.e., unlicensed), are still the most expensive option, at $2-$5/ride. 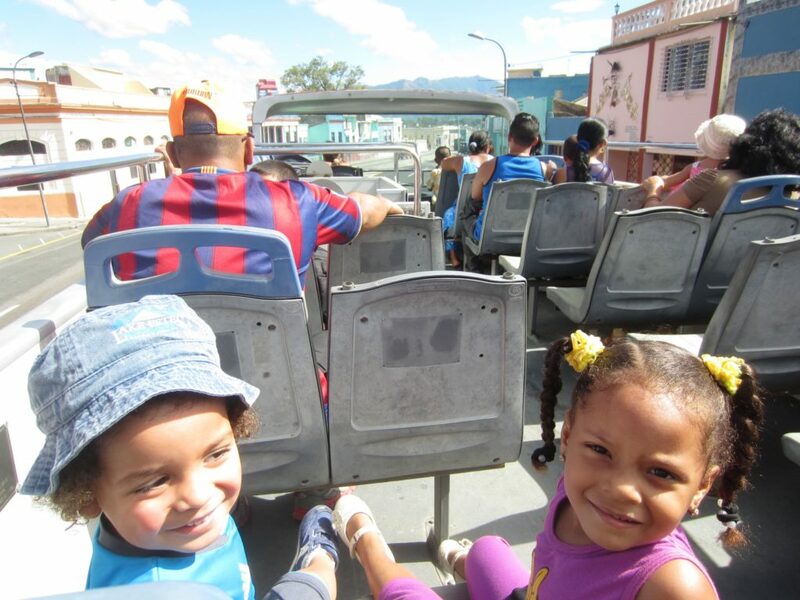 In addition, there is a new double-decker, open-air bus that runs from one end of the city – Santa Ifigenia cemetery, where the tombs of national poet José Martí and other independence and Revolutionary heroes are located – to the other end (the zoo) for just 3MN ($0.13) for adults. Touring Santiago in the new double-decker bus. Photo by Rebecca Bodenheimer. While riding it, we passed by some of the poorest neighborhoods of Santiago, such as San Pedrito, and saw that major rebuilding and construction efforts had taken place; my husband, a Santiago native, commented enthusiastically that he barely recognized these areas. Newly painted building on Avenida Garzón. Photo by Rebecca Bodenheimer. Many santiagueros (Santiago natives) attribute these positive changes to the efforts of Lázaro Expósito, the province’s First Secretary of the Cuban Communist Party, who was in charge of Santiago’s rebuilding efforts after Hurricane Sandy. He is one of the few party leaders who is genuinely appreciated by the people, undoubtedly due to his populist style of leadership – he is known to make unscheduled appearances around the city’s work sites – and to his ability to get things done within a bureaucracy that often moves at a snail’s pace. Before his current post in Santiago, he served in the same role in the neighboring province of Granma, where he transformed the city of Bayamo into one of the most livable on the island, stocking state stores with a variety of goods in pesos that were only available in CUC in the rest of the country. 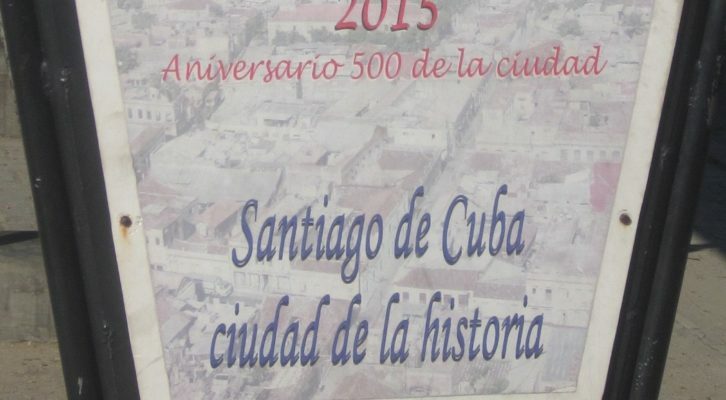 In general, Santiago de Cuba seems to be thriving. Beyond the much-improved situation for local residents, I saw a heavier presence of tourists than ever before, which suggests that the island’s second largest city may be emerging from the shadows of the capital. It seems apparent that the government has been investing in renewal projects outside of Havana, but the underlying objectives aren’t so clear. Are these efforts designed to garner and sustain loyalty in a region (eastern Cuba) that has historically been the most supportive of the Revolution? Are they meant to offer an attractive alternative to migrating to Havana, which many eastern Cubans have done in the past two decades in search of greater economic opportunity? Whatever the reasons, Santiago’s makeover has taken place at a historic moment – the reestablishment of diplomatic relations with the United States – and the city seems poised to benefit from what is sure to be an influx of American tourists. Rebecca Bodenheimer has been conducting research in Cuba since 2004 and writes about regionalism, racial politics, and contemporary popular and folkloric music on the island. She holds a PhD from UC Berkeley and is the author of Geographies of Cubanidad: Place, Race, and Musical Performance in Contemporary Cuba (2015). 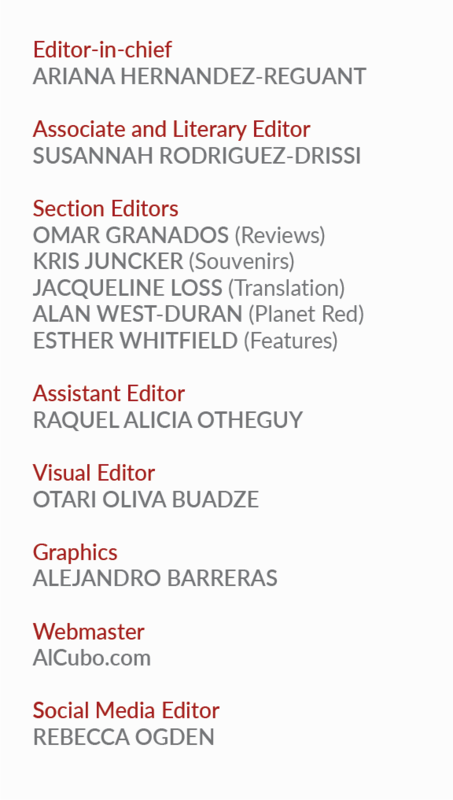 Thanks for this description. I’ll pass it along to my students before we go to Santiago.